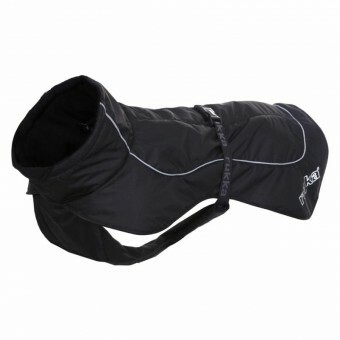 Special Order item: Delivery Time: 2-4 weeksColdzone keeps the dog warm and dry when outdoors. The needs of an active dog have been a key consideration in the design of the coat. Thanks to the half cape solution, the front leg openings are open as far as the seam of the collar enabling the dog’s front legs to move freely and making it more comfortable for the dog to walk even longer distances. The coat has a warm fleece lining and a well-covering hem. Thanks to the quick buckle closure, the coat is fast and easy to put on. An adjustable neckline and collar add the final touches for the perfect fit and protectiveness. A soft stretchy gusset on the front of the collar, underneath the snout, increases the comfort of the garment. There is a covered opening on the back for leash attachment. Elastic rear leg straps ensure that the coat stays in place in all conditions, also in activities of higher intensity. The coat has reflective piping and logo.